Édith Piaf (French: [edit pjaf] ( listen); born Édith Giovanna Gassion; 19 December 1915 – 10 October 1963) was a French vocalist, songwriter, cabaret performer and film actress noted as France's national chanteuse and one of the country's most widely known international stars. From the song "Hymne à l'amour"
Despite numerous biographies, much of Piaf's life is unknown. She was born Édith Giovanna Gassion in Belleville, Paris. Legend has it that she was born on the pavement of Rue de Belleville 72, but her birth certificate cites that she was born on 19 December 1915 at the Hôpital Tenon [fr], a hospital located at the 20th arrondissement. She was named Édith after the World War I British nurse Edith Cavell, who was executed 2 months before her birth for helping French soldiers escape from German captivity. Piaf – slang for "sparrow" – was a nickname she received 20 years later. Louis Alphonse Gassion (1881–1944), Édith's father, was a street performer of acrobatics from Normandy with a past in the theatre. He was the son of Victor Alphonse Gassion (1850–1928) and Léontine Louise Descamps (1860–1937), known as Maman Tine, a "madam" who ran a brothel in Bernay in Normandy. Piaf's mother abandoned her at birth, and she lived for a short time with her maternal grandmother, Emma (Aïcha). When her father enlisted with the French Army in 1916 to fight in World War I, he took her to his mother, who ran a brothel in Bernay, Normandy. There, prostitutes helped look after Piaf. The bordello had two floors and seven rooms, and the prostitutes were not very numerous, "about ten poor girls" as she later described, in fact five or six were permanent and a dozen for market and any busy days. The sub-mistress of the brothel, "Madam Gaby" could be considered a little like family since she became godmother of Denise Gassion, the half-sister born in 1931. Edith believed her weakness for men came from mixing with prostitutes in her grandmother's brothel. "I thought that when a boy called a girl, the girl would never refuse" she would say later. From the age of three to seven, Piaf was allegedly blind as a result of keratitis. According to one of her biographers, she recovered her sight after her grandmother's prostitutes pooled money to accompany her on a pilgrimage honouring Saint Thérèse of Lisieux. Piaf claimed this was the result of a miraculous healing. In 1929, at age 14, she joined her father in his acrobatic street performances all over France, where she first sang in public. At the age of 15, Piaf met Simone "Mômone" Berteaut [fr], who may have been her half-sister, and who became a companion for most of her life. Together they toured the streets singing and earning money for themselves. With the additional money Piaf earned as part of an acrobatic trio, she and Mômone were able to rent their own place; Piaf took a room at Grand Hôtel de Clermont (18 rue Véron [fr], 18th arrondissement of Paris), working with Mômone as a street singer in Pigalle, Ménilmontant, and the Paris suburbs (cf. the song "Elle fréquentait la rue Pigalle"). In 1932, she met and fell in love with Louis Dupont. Within a very short time, he moved into their small room, where the three lived despite Louis' and Mômone's dislike for each other. Louis was never happy with the idea of Piaf's roaming the streets, and continually persuaded her to take jobs he found for her. She resisted his suggestions, until she became pregnant and worked for a short while making wreaths in a factory. In February 1933, the 17-year-old Piaf gave birth to her daughter, Marcelle (nicknamed Cécelle) at the Hôpital Tenon. Like her mother, Piaf found it difficult to care for the child, as she had little maternal instinct, parenting knowledge, or domestic skills. She rapidly returned to street singing, until the summer of 1933, when she opened at Juan-les-Pins, Rue Pigalle. Following an intense quarrel over her behavior, Piaf left Louis Dupont (Marcelle's father) taking Mômone and Marcelle with her. The three stayed at the Hôtel Au Clair de Lune, Rue André-Antoine. During this time, Marcelle was often left alone in the room while Piaf and Mômone were out on the streets or at the club singing. Dupont eventually came and took Marcelle away, saying that if Édith wanted the child, she must come home. Like her own mother, Piaf decided not to come home, though she did pay for childcare. Marcelle died of meningitis at age two. It is rumored that Piaf slept with a man to pay for Marcelle's funeral. In 1935, Piaf was discovered in the Pigalle area of Paris by nightclub owner Louis Leplée, whose club Le Gerny's off the Champs-Élysées was frequented by the upper and lower classes alike. He persuaded her to sing despite her extreme nervousness, which, combined with her height of only 142 centimetres (4 ft 8 in), inspired him to give her the nickname that would stay with her for the rest of her life and serve as her stage name, La Môme Piaf (Paris slang meaning "The Waif Sparrow" or "The Little Sparrow"). Leplée taught her the basics of stage presence and told her to wear a black dress, which became her trademark apparel. Later, she would always appear in black. Leplée ran an intense publicity campaign leading up to her opening night, attracting the presence of many celebrities, including actor and singer Maurice Chevalier. The bandleader that evening was Django Reinhardt, with his pianist, Norbert Glanzberg. :35 Her nightclub gigs led to her first two records produced that same year, with one of them penned by Marguerite Monnot, a collaborator throughout Piaf's life and one of her favourite composers. On 6 April 1936, Leplée was murdered. Piaf was questioned and accused as an accessory, but acquitted. Leplée had been killed by mobsters with previous ties to Piaf. A barrage of negative media attention now threatened her career. To rehabilitate her image, she recruited Raymond Asso, with whom she would become romantically involved. He changed her stage name to "Édith Piaf", barred undesirable acquaintances from seeing her, and commissioned Monnot to write songs that reflected or alluded to Piaf's previous life on the streets. In 1940, Piaf co-starred in Jean Cocteau's successful one-act play Le Bel Indifférent. The German occupation of Paris did not stop her career; she began forming friendships with prominent people, including Chevalier and poet Jacques Bourgeat. She wrote the lyrics of many of her songs and collaborated with composers on the tunes. Spring 1944 saw the first cooperation and a love affair with Yves Montand in the Moulin Rouge. In 1947, she wrote the lyrics to the song "Mais qu’est-ce que j’ai ?" (music by Henri Betti) for Yves Montand. She contributed greatly to the revolutionizing of the cabaret-genre. Within a year, he became one of the most famous singers in France. She broke off their relationship when he had become almost as popular as she was. During this time, she was in great demand and very successful in Paris as France's most popular entertainer. After the war, she became known internationally, touring Europe, the United States, and South America. In Paris, she gave Atahualpa Yupanqui (Héctor Roberto Chavero) – a central figure in the Argentine folk music tradition – the opportunity to share the scene, making his debut in July 1950. She helped launch the career of Charles Aznavour in the early 1950s, taking him on tour with her in France and the United States and recording some of his songs. At first she met with little success with U.S. audiences, who expected a gaudy spectacle and were disappointed by Piaf's simple presentation. After a glowing 1947 review in the New York Herald Tribune by the influential New York critic Virgil Thomson, himself a contributor to international avant garde culture, however, her popularity grew, to the point where she eventually appeared on The Ed Sullivan Show eight times and at Carnegie Hall twice (1956 and 1957). Piaf's signature song, "La Vie en rose", was written in 1945 and was voted a Grammy Hall of Fame Award in 1998. Bruno Coquatrix's famous Paris Olympia music hall is where Piaf achieved lasting fame, giving several series of concerts at the hall, the most famous venue in Paris, between January 1955 and October 1962. Excerpts from five of these concerts (1955, 1956, 1958, 1961, 1962) were issued on record and CD and have never been out of print. The 1961 concerts, promised by Piaf in an effort to save the venue from bankruptcy, debuted her song "Non, je ne regrette rien". In April 1963, Piaf recorded her last song, "L'Homme de Berlin". Piaf's career and fame gained momentum during the German occupation of France. She performed in various nightclubs and brothels, which flourished during the 1940–1945 Années Erotiques (book title of Patrick Buisson, director of the French history channel). Various top Paris brothels, including Le Chabanais, Le Sphinx, One Two Two, La rue des Moulins, and Chez Marguerite, were reserved for German officers and collaborating Frenchmen. She was, for example, invited to take part in a concert tour to Berlin, sponsored by the German officials, together with artists such as Loulou Gasté, Raymond Souplex, Viviane Romance and Albert Préjean. In 1942, Piaf was able to afford a luxury flat in a house in the fancy 16th arrondissement of Paris (today rue Paul-Valéry). She lived above the L'Étoile de Kléber, a famous nightclub and bordello close to the Paris Gestapo headquarters. Piaf was deemed to have been a traitor and collaboratrice. She had to testify before a purge panel, as there were plans to ban her from appearing on radio transmissions. However, her secretary Andrée Bigard, a member of the Résistance, spoke in her favour after the Liberation. According to Bigard, she performed several times at prisoner of war camps in Germany and was instrumental in helping a number of prisoners escape. Piaf was quickly back in the singing business and then, in December 1944, she went on stage for the Allied forces together with Montand in Marseille. At age 17 Piaf had a daughter, Marcelle, who died aged two. Piaf neither wanted nor had other children. The love of Piaf's life, the married boxer Marcel Cerdan, died in a plane crash in October 1949, while flying from Paris to New York City to meet her. Cerdan's Air France flight, on a Lockheed Constellation, crashed in the Azores, killing everyone on board, including noted violinist Ginette Neveu. Piaf and Cerdan's affair made international headlines, as Cerdan was the former middleweight world champion and a legend in France in his own right. 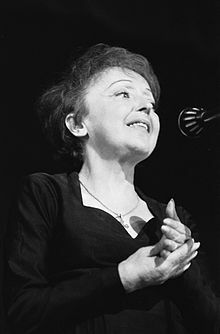 In 1951, Piaf was seriously injured in a car crash along with Charles Aznavour, breaking her arm and two ribs, and thereafter had serious difficulties arising from morphine and alcohol addictions. Two more near-fatal car crashes exacerbated the situation. Jacques Pills, a singer, took her into rehabilitation on three different occasions to no avail. 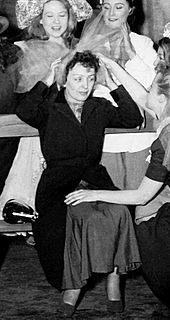 Piaf married Jacques Pills (real name René Ducos), her first husband, in 1952 (her matron of honour was Marlene Dietrich) and divorced him in 1957. In 1962, she wed Théo Sarapo (Theophanis Lamboukas), a Greek hairdresser-turned-singer and actor who was 20 years her junior. The couple sang together in some of her last engagements. Piaf lived mainly in Belleville, Paris, with her father from 1915 to 1931. From 1934 to 1941, she lived at 45 rue de Chézy in Neuilly-sur-Seine; she lived alone from 1941 to 1952 and with Jacques Pills from 1952 to 1956. She continued to live there alone from 1956 to 1959. In her final years she lived at 23 rue Édouard Nortier in Neuilly-sur-Seine – alone from 1959 to 1962 and with Théo Sarapo from 1962 until her death in 1963. Years of alcohol abuse alongside copious amounts of medications, initially for arthritic pain and later insomnia, took their toll on Piaf's health. A series of car accidents only exacerbated her addictions and she eventually underwent a series of surgeries for a stomach ulcer in 1959. Coupled with a deteriorating liver and the need for a blood transfusion, by 1962 she had lost a significant amount of weight, reaching a low of 30 kg (66 pounds). Drifting in and out of consciousness for several months, she died of liver cancer at age 47 at her villa in Plascassier (Grasse), on the French Riviera, on 10 October 1963, the day before filmmaker and friend Jean Cocteau died. Her last words were "Every damn thing you do in this life, you have to pay for." It is said that Sarapo drove her body back to Paris secretly so that fans would think she had died in her hometown. She is buried in Père Lachaise Cemetery in Paris next to her daughter Marcelle, where her grave is among the most visited. Buried in the same grave are her father, Louis-Alphonse Gassion, and Théo (Lamboukas) Sarapo. The name inscribed at the foot of the tombstone is Famille Gassion-Piaf. Her name is engraved on the side as Madame Lamboukas dite Édith Piaf. Although she was denied a funeral Mass by Cardinal Maurice Feltin because of her lifestyle, her funeral procession drew tens of thousands of mourners onto the streets of Paris and the ceremony at the cemetery was attended by more than 100,000 fans. Charles Aznavour recalled that Piaf's funeral procession was the only time since the end of World War II that he saw Parisian traffic come to a complete stop. Since 1963, the French media have continuously published magazines, books, television specials and films about the star often coinciding with the anniversary of her death. In 1973, the Association of the Friends of Édith Piaf was formed followed by the inauguration of the Place Édith Piaf in Belleville in 1981. Soviet astronomer Lyudmila Georgievna Karachkina named a small planet, 3772 Piaf, in her honor. In Paris, a two-room museum is dedicated to her, the Musée Édith Piaf (5, Rue Crespin du Gast). On 10 October 2013, fifty years after her death, the Roman Catholic Church gave her a memorial Mass in the St. Jean-Baptiste Church in Belleville, Paris, the parish into which she was born. A concert at The Town Hall in New York City commemorated the 100th anniversary of Piaf's birth on 19 December 2015. Hosted by Robert Osborne and produced by Daniel Nardicio and Andy Brattain, it featured Little Annie, Gay Marshall, Amber Martin, Marilyn Maye, Meow Meow, Elaine Paige, Molly Pope, Vivian Reed, Kim David Smith, and Aaron Weinstein. Piaf's life has been the subject of several films and plays. Piaf, voz y delirio. (2017), by Leonardo Padrón. The following titles are compilations of Piaf's songs, and not reissues of the titles released while Piaf was active. ^ a b c d e f g h i j k l m n o p q r s t u v w Huey, Steve. Édith Piaf biography at AllMusic. Retrieved 22 December 2015. ^ a b c d e f Burke, Carolyn. No Regrets: The Life of Edith Piaf, Alfred A. Knopf 2011, ISBN 978-0-307-26801-3. ^ Morris, Wesley (15 June 2007). "A complex portrait of a spellbinding singer". The Boston Globe. Retrieved 3 September 2009. ^ a b c d e f Rainer, Peter (8 June 2007). "'La Vie en rose': Édith Piaf's encore". The Christian Science Monitor. Boston. Retrieved 3 September 2009. ^ a b c d e f g "Biography: Édith Piaf". Radio France Internationale Musique. Archived from the original on 27 February 2003. Retrieved 3 September 2009. ^ Vallois, Thirza (February 1998). "Two Paris Love Stories". Paris Kiosque. Archived from the original on 14 July 2007. Retrieved 9 August 2007. ^ a b c d Ray, Joe (11 October 2003). "Édith Piaf and Jacques Brel live again in Paris: The two legendary singers are making a comeback in cafes and theatres in the City of Light". The Vancouver Sun. Canada. p. F3. Archived from the original on 11 December 2012. Retrieved 18 July 2007. ^ Willsher, Kim (12 April 2015). "France celebrates singer Edith Piaf with exhibition for centenary of her birth". The Guardian. ISSN 0261-3077. Retrieved 15 August 2017. ^ a b c "Piaf's Paris". Retrieved 9 June 2013. ^ Allen, Brooke (28 March 2011). ""No Regrets": Discovering Edith Piaf's epically messy love life". Salon. Retrieved 2 August 2014. ^ a b c Fine, Marshall (4 June 2007). "The soul of the Sparrow". Daily News. New York. Retrieved 19 July 2007. ^ a b Mayer, Andre (8 June 2007). "Songbird". CBC. Retrieved 19 July 2007. ^ Thomson, Virgil. "La Môme Piaf", New York Herald Tribune, 9 November 1947. ^ Véronique Willemin, La Mondaine, histoire et archives de la Police des Mœurs, hoëbeke, 2009, p. 102. ^ a b c d e f Jeffries, Stuart (8 November 2003). "The love of a poet". The Guardian. United Kingdom. Retrieved 19 September 2007. ^ Sous l’œil de l’Occupant, la France vue par l’Allemagne, 1940–1944. Éditions Armand Colin, Paris 2010, ISBN 978-2-200-24853-6. ^ a b Robert Belleret: Piaf, un mythe français. Verlag Fayard, Paris 2013. ^ Myriam Chimènes, Josette Alviset: La vie musicale sous Vichy. Editions Complexe, 2001, S. 302. ^ "Edith Piaf Profile – The Tragic Life of Edith Piaf – About.com". Worldmusic.about.com. Retrieved 1 April 2010. ^ William Langley (13 October 2013). "Edith Piaf: Mistress of heartbreak and pain who had a few regrets after all". The Daily Telegraph. Retrieved 13 June 2015. Wikimedia Commons has media related to Édith Piaf.